It’s no secret that we’ve been enjoying squash this fall. We’ve made macaroni & cheese, spaghetti boats, chili and now this cheesy baked spaghetti squash. I have to admit, I was a little skeptical when making this recipe. I was worried that everything would turn into one sticky pot full of mush, but boy was I wrong! It was just like eating fettuchini alfredo- creamy and flavorful but 10x healthier! 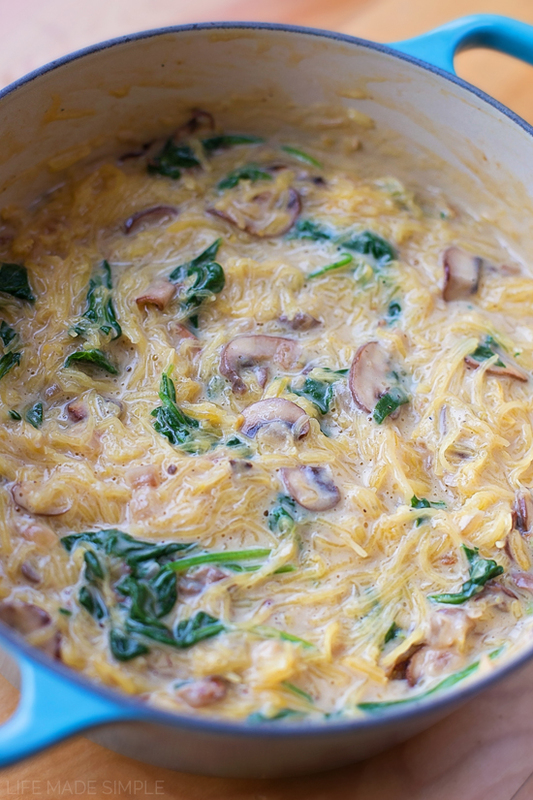 To start, you’re going to need a small spaghetti squash. Probably the smallest you can find- you’d be surprised by how much “spaghetti” it creates. Cut in half, remove the strings and seeds and then rub the cut sides with a little olive oil. Place them cut side down on a foil lined baking sheet and roast them for about 35-45 minutes at 450 degrees. When they’re nice and tender, remove them, flip them and use a fork to grate the inside to get the “noodles.” Let the squash cool in the peels while preparing the sauce. The base or sauce for this dish couldn’t be easier. 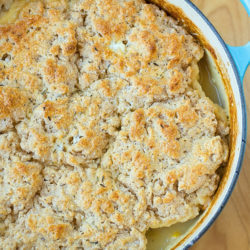 In a large pot or Dutch oven set over medium heat, melt a tablespoon of butter. 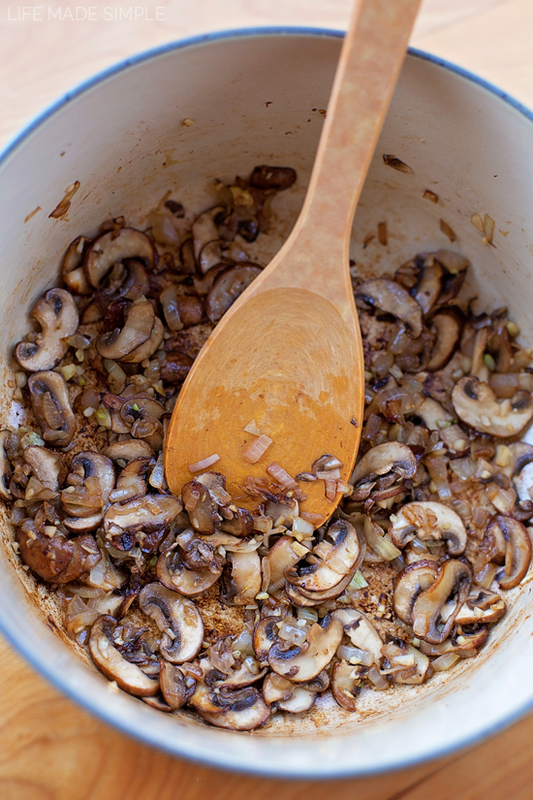 Add the sliced crimini mushrooms and cook for 3-4 minutes, then add the onions. The mushrooms should get nice and brown and will form a coating on the bottom, this is exactly what you want! 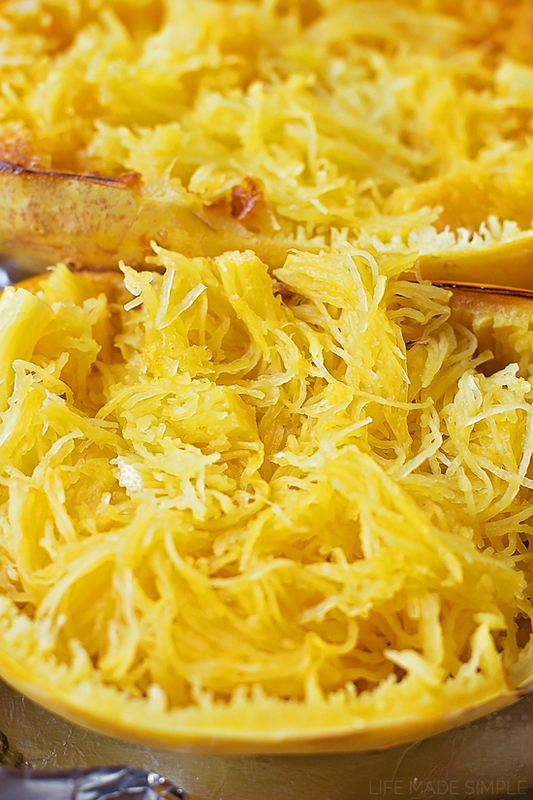 All of that color = flavor, something that spaghetti squash definitely needs! Add the minced garlic and cook just until fragrant. Reduce the heat to low, sprinkle in flour. If you plan on making this gluten-free, skip the flour and use cornstarch a little later. Stir the mixture constantly for 2-3 minutes, then slowly whisk in the chicken broth and milk while gradually turning the heat up to medium-high (this is where you’d add the cornstarch, after whisking in the liquids). Add the salt, black pepper and cayenne pepper. Simmer for 3-4 minutes or until the sauce becomes nice and thick, then remove the pot from the heat and whisk in the cheddar cheese and 2 tbsp. of parmesan. Once the cheese has melted add the spinach and squash. Stir and sprinkle the remaining parmesan over top. Place it back in the oven and bake for about 30 minutes at 375 degrees, this will give the squash a bubbly and browned top. It’s definitely a step you don’t want to skip! Let the squash cool for a good 10 minutes and then dig in! It’s creamy without being too rich, a lightened up version of alfredo. And the squash in place of noodles helps pack in the veggies without overdoing the carbs. I especially love the texture of the onions, mushrooms and spinach, it wouldn’t be the same without those three ingredients. 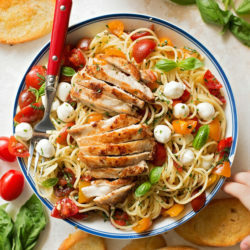 I hope you’ll give this dish a try, I think you’re going to love it! 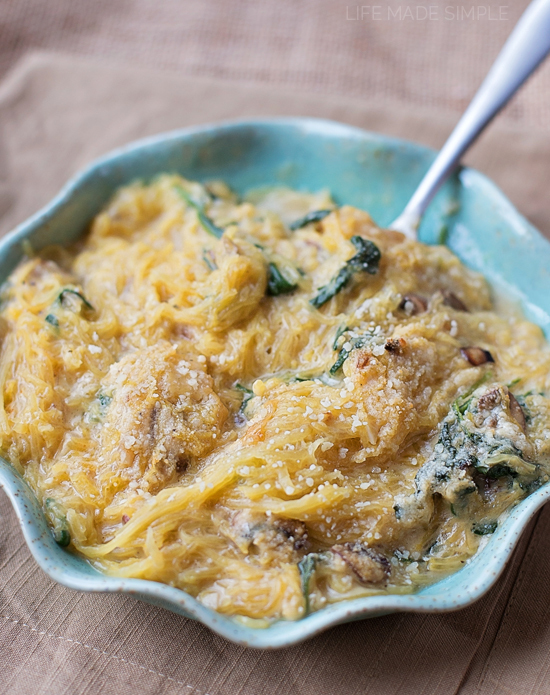 This cheesy baked spaghetti squash is cozy, filling and packed full of veggies. 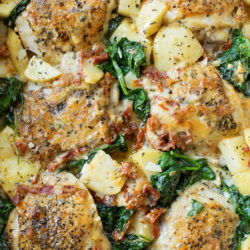 It's the perfect meal for chilly fall nights! Preheat oven to 450 degrees, rub the cut side of the squash with olive oil and place on a foil lined baking sheet. Place in the oven and bake for 35-45 minutes or until tender. 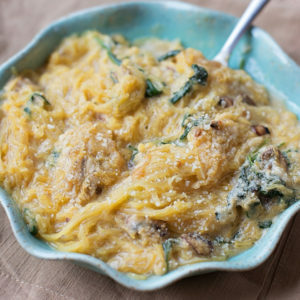 Using a fork grate the squash to create "spaghetti." Leave in the squash until needed. Lower oven temperature to 375 degrees. In a large pot or Dutch oven set over medium heat, melt the butter. Add mushrooms and cook for 3-4 minutes, then add onions. The mushrooms should get nice and brown (they should leave browned bits on the bottom of your pan, this will add to the flavor of the dish) while the onions remain translucent. Add the garlic and cook until fragrant. Reduce heat to low, sprinkle in flour. Stir the mixture constantly for 2-3 minutes, then slowly whisk in the chicken broth and milk while gradually turning the heat up to medium-high. Add the salt, black pepper and cayenne pepper. Simmer for 3-4 minutes until thick, then remove from the heat and whisk in the cheddar cheese and 2 tbsp. of parmesan. Once the cheese has melted add the spinach and squash. Sprinkle the remaining parmesan over top and return to the oven to bake for 30 minutes. *This recipe can be made gluten-free by using cornstarch instead of flour. Just add it after pouring in the milk and chicken broth, you may need to simmer for a few minutes longer to allow it to thicken.